Rabat — Japan loaned Morocco 2.3 billion dirhams (about $ 291 million) to fund drinking water projects and the national rural road program II. The two loan agreements were signed by Chief Representative of the Japan International Cooperation Agency (JICA), Eihiko Obata, and the Managing Director of the national drinking water company (ONEP), Ali Fassi Fihri, on the one hand, and the Director of the Fund for road financing (CFR), Ahmed Imzal, on the other. The first loan, worth 1.7 billion dirhams, provides for funding “Fez-Meknes drinking water supply” project. 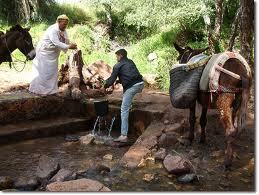 It is meant to improve living conditions of the inhabitants of these regions. The second loan (583 million dirhams) is intended to fund the “national rural road program II”. This project aims at facilitating the movement of rural populations, promoting economic activities in rural areas and reducing social disparities between urban and rural areas. On this occasion, the two parties praised the level of financial cooperation between the two countries. According to the Economy and Finance Ministry, JICA loaned Morocco some 267 billion yens (about 20 billion dirhams) during the last ten years to fund development projects.